I made this card for a friend that ordered it for her hubby, she told me the colors she wanted and it turned out just the way she wanted it. She wrote a special saying inside for her hubby for their 20th Anniversary. This is a very simple card to make. Just take you craft paper and cut it to 4 1/2 " x 4". Then take your papers and cut and stack them. 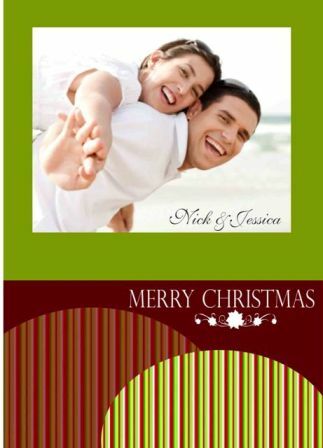 Take your printed paper and glue it 1/2 way on the card then use a solid paper. I used brads to adhere it. 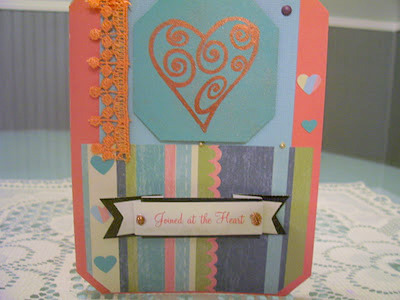 Then I cut one more piece of card stock and stamped it with a heart using mt perfect medium and perfect pearls. 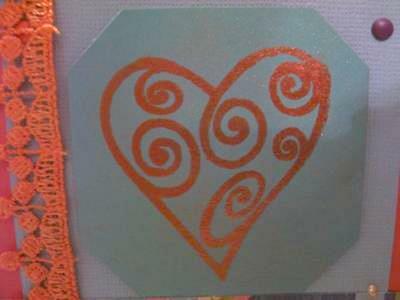 I dusted the heart and I added a lace border to the left side of the card and a banner to the bottom center (joined at the heart). Using my Mavy punch I added my little hearts. Lastly I added some liquid pearls to my card. 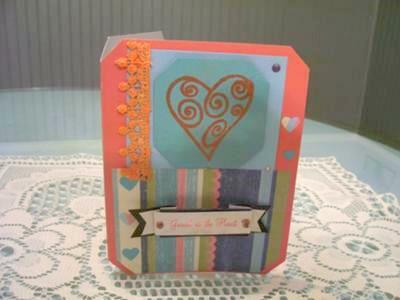 I hope you all enjoy this card and would love for you to come visit my blog, Something Crafty by Dottie.